Salsa: It&apos;s not just for tomatoes anymore! Chef Rocky Durham experiments with such ingredients as pineapple, cucumber, and strawberries in these surprising summer sauces. My dad was fond of joking that if you don’t like the weather in New Mexico, you could just leave. I tend to agree: New Mexico’s weather is gorgeous year-round, and each month has its own distinct beauty—September has changing aspen leaves and chile-scented breezes, December has farolitos and snow-covered mountains, and March has dramatic skies and gusty winds. But while each of those months is spectacular, they’re perhaps best enjoyed through a picture window. June has many of the attributes New Mexico is famous for: warm days and all the sunshine you can handle. In summer, we do one kind of weather here: gorgeous! Outdoor beauty of the June variety demands frequent sojourns into nature, something our state has in spades. In the Land of Enchantment, we enjoy June in limitless outdoor venues: kicking back in the shade on the portal; biking to the Santa Fe Plaza; driving along the Enchanted Circle through Red River, Angel Fire, and other destinations in northern New Mexico; or picnicking in a park, whether city, state, or national. As a chef, I consider not only our destination, but what we’re going to eat when we get there. And as a polite party guest, I never show up empty-handed. Either way, June’s hot food is salsa! Although salsa may be as common in New Mexico as ketchup is anywhere else, our condiment of choice need not be tomato-based. In Spanish, salsa simply means sauce, and the following recipes offer a wonderful spectrum of ingredients and flavors for sauces. Consider this: If a tomato is a fruit (and it is), then what other fruits might take its place in a salsa for summer flavor, flair, and variety? Why not pineapple? That simple adjustment to a standard recipe will yield an entirely new, delicious creation. But don’t stop there. Throw a few pineapple slices on the grill to get them nice and caramelized, then dice them for your salsa. You can serve this condiment on almost any grilled meat. 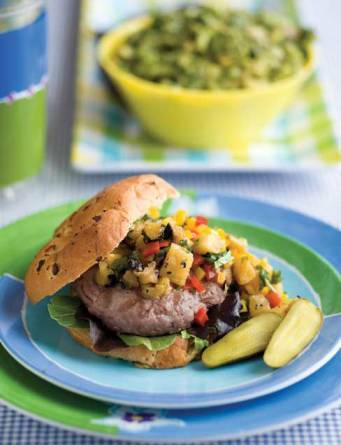 Grilled pork chops with chunky pineapple salsa might be a $20 entrée in some restaurants, but you can make it at home for a lot less. And if you don’t eat pork, try pineapple salsa on a salmon fillet instead, or perhaps a turkey burger. Genius! If you want to stick with the classic method of serving salsa—with tortilla chips—you can still get creative. 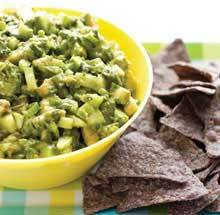 Make a standout avocado salsa by dicing the main ingredient, then adding some diced cucumber for crunch. This cooling creation will cause large baskets of blue-corn chips to magically vanish. Finally, one of these recipes crosses into territory rarely traversed by salsa makers: desserts. (Stay with me. I’m a trained professional.) If your mouth is burning from one of your fresh, homemade salsas, the perfect antidote is a cold dish of ice cream. 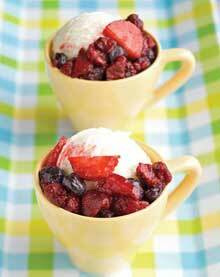 Of course, in this meal, ice cream serves only as a foil for a delicious berry salsa: replace the traditional tomato with an assortment of summer berries. Chile heads might want to add a little minced serrano or habanero chile to the mix. After all, chile, too, is a fruit. 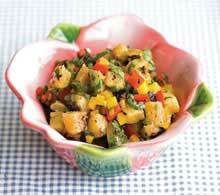 Use this salsa to top any number of grilled meats for a combination of the sweet and the savory. Preheat grill and clean with wire brush. In large bowl, gently toss pineapple slices with olive oil. Arrange slices on grill and cook until pronounced grill marks are produced (4–5 minutes). Flip slices and grill on other side another 4–5 minutes. Remove from grill and let cool before dicing. Dice pineapple slices and combine with remaining ingredients. Adjust seasonings to taste. Guacamole and chips are another staple of New Mexico entertaining. Make your avocado creation stand out by dicing (instead of mashing) the main ingredient. Cut avocados in half lengthwise and remove pits. With large spoon, scoop avocado flesh from skins. On cutting board, place avocado halves cut side down and dice. Combine with all remaining ingredients in large bowl, and mix gently until well combined. Taste and adjust seasonings. Adding the lime juice and sugar to this recipe an hour in advance will macerate the fruit and yield sweet, sticky juices that will bind together this dessert sauce. Place berries in large bowl of nonreactive material (e.g., Pyrex). Add sugar and lemon juice and mix well. Cover and cool in refrigerator 1 hour. Stir in mint, orange zest, and salt. Serve over vanilla ice cream, cheesecake, pound cake, or sorbet.